The titles struck me as handsomethe titles and captions and place labels on a page I have of Henri Abraham Chatelain’s Atlas Historique. I’d already modeled Antiquarian Scribe after the neat, slanted penmanship used in the body text of Chatelain’s famous old world atlas; now I felt compelled also to digitize this legible roman handlettering. The letterforms are strong and rugged. They’ve got a certain deft, organic character. A personality. I can’t fully explain it. 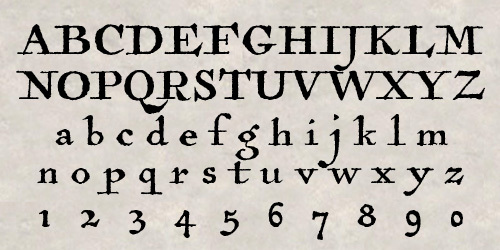 But this antique alphabet seems suitable for many applications. 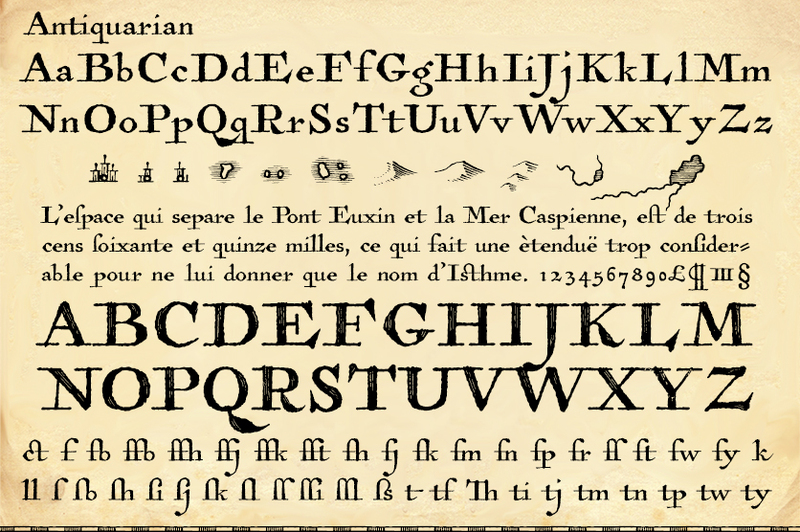 Antiquarian is a full-featured font that works well with Antiquarian Scribe. The OpenType release adds true small caps, numerous ligatures, Central/Eastern European and Greek alphabets, and several distinctive cartographic ornaments. US$39.